Now I've done it! After loading up HOTS to try out Tracer (and not getting to as someone else was already using her), I've gotten myself up to rank 10 and now have a 7 day stimpack (double xp and 2.5x gold). Looks like I will be playing a bit more HOTS over the next week or so to effectively halve the time I spend getting to rank 12 for my Diablo 3 portrait and pennant. Funny how I buy Overwatch and spend more time with the bonus content than the actual game! A whole lot of warriors and assassins... any suggestions for which hero(s) I should consider getting next? I'm guessing at the very least I should get a support and specialist to round off the roster a bit better. Last edited by Mugsy on 11 May 2018, 19:04, edited 3 times in total. Good point. Johanna use to be 10k gold and now she's 4k despite being upper tier. Might just stick to getting the 2k and 4k gold heroes first. LOL. Didn't realise that if you get a character to level 5, you get 500 gold... do 4 and that's a 2k character one can buy (not including daily bonuses and extra gold from playing matches). I'm gonna be able to get more than 1 or 2 heroes as I have 4 characters at level 4... some almost at lvl5. HOTS' 1yr anniversary is next week Thurs/Fri. Apparently, there's going to be a 50% xp bonus (we'll have to see if there are any other bonuses). I'm considering getting the starter bundle to get another stimpack bonus at that time. I don't have any of those characters as yet, Muradin is top melee character, I wouldn't mind Raynor in my line up just for fun, and Malfurion is a decent enough healer I hear (meaning I can save on getting Lili). Means there's 6000 gold I can put towards another character and I can gain xp and gold faster with that stimpack. I still haven't spent on any heroes as yet... the weekly rotations is keeping me occupied now that I've got the full 10 character rotation unlocked. I'm at 11 of 14 characters at lvl5... almost able to unlocked ranked play but enjoying casual more. Yeah, time is the key thing... so many games to play through. I've just stuck with HOTS at the moment because of the expiration date with the stimpack. Bloody things activate straight away when you purchase them so you can't put it off. It's why I haven't bought the starter pack as yet. I really want to take a break from HOTS after the current stimpack expires. But it looks like I'm gonna get 1 night off before the (rumoured) anniversary buff activates. I'll probably get the starter pack then... get a massive buff from the stimpack, anniversary buff and friends buff and level up as many characters to lvl5 as I can. With any luck, I might hit 30k gold by the end of it. Then I'll casually continue to play and just focus on trying all characters out in the weekly rotation getting as many to rank 5 for that 500g... will decide which heroes to purchase then. EDIT: Not a rumour. See next post. "To mark its upcoming one-year anniversary on June 2, Blizzard has announced the details of a bonus event that begins next week. From June 2-14, all players will receive 50 percent bonus XP for every game they play. Combined with the 50 percent bonus you always get for playing with a Battle.net friend, you should be able to easily grind out some levels (and, as a result, gold) in June. By logging in during that period, you'll also earn yourself the exclusive First Anniversary portrait pictured above. Finally, for the duration of the event, Blizzard will offer a special First Anniversary bundle that offers "deep discounts." It consists of eight characters and the Tyrael's Charger mount, as well as a bonus seven-day stimpack (which you could conceivably stack with the bonus XP event for even quicker leveling). A price for this wasn't announced, but it includes a mix of newer and older characters: The Butcher, Sgt. Hammer, Xul, Lt. Morales, Uther, Kerrigan, Artanis, and Arthas. Blizzard added dynamic bundle pricing last year, meaning however much this costs, it'll be even cheaper for you if you already own any of its contents." That pack doesn't look too bad and considering I have Artanis, that's a little bit cheaper for me. Now lets see how deep those discounts get. If you get to lvl10, you'll also get Sylvanas. Looks like I'm gonna be leveling up heroes on my alt account as well! Well, that's a week worth of intensive farming to milk that stimpack. I think my account is well stimulated. Made it to rank 25... got my balance up to 26,625 gold in total. It's just a pity I didn't get Raynor leveled up this evening like I had planned (only got Asmodan done) but I plan to purchase the starter pack in the future anyway so will get myself another stimpack then. Now lets see what price this anniversary bundle will be priced at? That's good that someone I know is enjoying Tracer. She's SO FRAGILE! I take it you like playing the nimble game? I'm personally digging the specialist characters. They're designed to siege the enemy defenses. Lots of fun to be had which is why it's really good of Blizzard to give out Sylvanas for those reaching lvl10 under the 'Recruit a Friend' scheme. She's able to disable the structures that attack you as well as nullifying mercenaries making it easier to capture them. It sounds like you've got the same problem as me with an overabundance of assassin characters. I'm assuming it's Raynor, Tracer and Jaina in your roster? Ideally, you'd want to play the free weekly rotation heroes first (and earn gold in the process) before deciding which ones to buy. If you play through the weekly roster and get everyone to lvl5, you get 500 gold for each character. It gives you a chance to find out which character for each class you enjoy playing as so you don't waste your gold on the wrong character. Bummer about your lag this evening though. And your 5 day stimpack should be active now too so the clock is ticking. We'll have to do a few games so you can get up to lvl10 while the stimpack is active. Of course, at lvl10, that'll activate a freebie 10 day stimpack too. Of course, the cheapest deal is still the starter pack which is further discounted for you since you have Raynor. 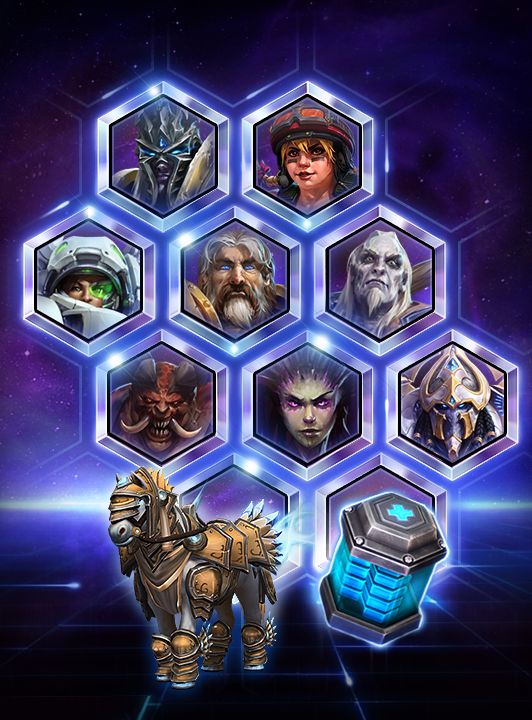 Base cost is US$4.99 and comes with a stimpack, Raynor, Malfurion, Muradin and the War Horse mount. Blizzard really know how to take one's money! I just purchased the Anniversary Bundle... the prices in game are in AUD! How sweet is that? Now I've been suckered into another week of intensive grinding thanks to that stimpack. does the stimpack stack with the anniversary bonus? kharis wrote: does the stimpack stack with the anniversary bonus? So that's +100% xp bonus on the stimpack, then +50% xp from the anniversary bonus, then maybe +50% 'play with friends' buff too. So all up, potentially triple xp atm. I purchased the anniversary bundle just after midday today so have until Saturday morning to milk it. Hoping to get all of the next rotation of weekly free to play heroes to lvl5 too. That might just get me close to 40k gold. I can see why Lunara is a 10k gold hero... OP as she has high hit damage and DOT to finish off enemies. Not sure I want to spend the gold on her though. Hit lvl30 and 33000 gold! 10 more levels to go. But the savings from those 3 heroes is 10k gold in game so I can get something else now. Had the best game ever tonight and using Sgt Hammer for the first time. Quickmatch and the other team was decently matched with us. I spent more time hitting the defense though to level up faster. Decided to pick up that BFG as it looked fun and before I knew it, I had the orbital upgrade too so I took a pretty good shot at the enemy core. Decided to push after taking down most of their defenses and got the core down to 1% alone before they took me out... then my BFG shot came around! The whole team couldn't believe what just happened. Tempted to get the new hero but I fear without voice comms, he won't be as useful.